We demonstrate that a meaningful estimation of the neuronal network dynamics from single measured variable is now possible by incorporating biophysical neuronal models into a model-based control framework. Specifically, we assimilate noisy membrane potential (V) measurements from individual hippocampal neurons to reconstruct the dynamics of networks of these cells, their extracellular microenvironment, and the activities of different neuronal types during seizures. We used two-compartmental models for the pyramidal cells (PCs) and interneurons (INs): a cellular compartment and the surrounding extracellular microenvironment. The membrane potentials of both cells were modeled by Hodgkin-Huxley equations containing sodium, potassium, calcium-gated potassium, and leak currents. The current equations were augmented with dynamic variables representing the intra- and extracellular ion concentrations (K+, Na+, and Ca2+). To estimate and track the dynamics of the neuronal networks, we applied a nonlinear ensemble version of the Kalman filter, the Unscented Kalman Filter (UKF) . Details of the model and UKF implementation can be found in [2, 3]. In Fig. 1 we show an example where we use V measurements to estimate the rest of the dynamics of CA1 PC. Fig. 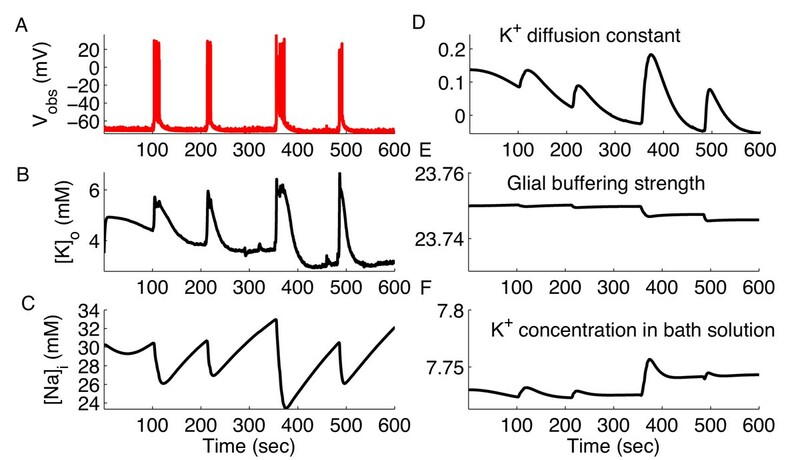 1A shows an intracellular recording from a PC during seizures, and plot the estimated [K]o in Fig. 1B. As is clear from the figure the [K]o oscillates as the cell goes into and out of seizures. The [K]o begins to rise as the cell enters seizures and peaks with the maximal firing frequency, followed by decreasing [K]o as the firing rate decreases and the seizure terminates. Higher [K]o makes the PC more excitable by raising the reversal potential for K+ currents. The increased K+ reversal potential causes the cell to burst fire spontaneously. Changes in the [Na]i are closely coupled with the changes of [K]o (Fig. 1C). As shown in panels (1D-F) we reconstructed the parameters controlling the microenvironment of the cell. These parameters included the diffusion constant of K+ in the extracellular space, K+ buffering strength of glia, and K+ concentration in the reservoir of the perfusing solution in vitro (or in the vasculature in vivo) during seizures. In conclusion, we demonstrated that estimating the neuronal microenvironment and neuronal interactions can be performed by embedding our improving neuronal models within a model-based state estimation framework. This approach can provide a more complete understanding of otherwise incompletely observed neuronal dynamics during normal and pathological brain function. Assimilating spontaneous seizure data by whole cell recording from CA1 hippocampal pyramidal neurons. (A) Measured V (red) from single PC during spontaneous seizures. Estimated (black) [K]o (B), [Na]i (C), K+ diffusion constant (D), glial buffering strength (E), and K+ concentration in bath solution (F).